An Employee Stock Ownership Plan (ESOP) is a type of employee benefit that encourages the employees to acquire ownership of the firm. 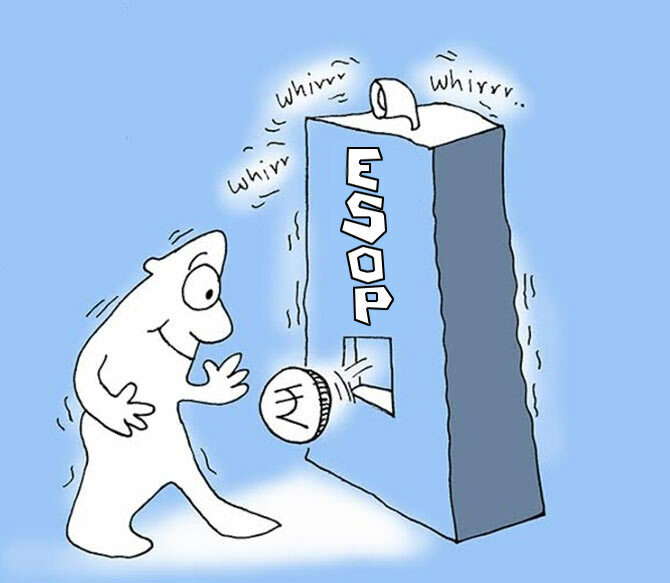 ESOP is a foreign concept, applied and used throughout the world now. This is given usually at the end of a year to motivate employees. The employer has the sole right to decide who will get this option. Although the employee has the option to buy these shares at a pre-decided price before the exercise date, there are still some rules and regulation, laid out by the Companies rule, that need to be followed. Grant Date: It is the day when the employer and the employee decide to get into an agreement of owning shares in the future. Exercise Price: This is the price at which the employee buys the shares. It is usually less than the existing Fair Market Value (FMV) of the shares. These techniques are used to retain high performing employees from leaving the firm. ESOPs are issued usually at the end of the year so that it could serve as an incentive for remaining with the organization for receiving that grant. This is a beneficial deal as the company intends to make the employees, an owner of the company. The companies which are tight on cash can avail these option. These firms make their package competitive by offering such incentives. If the price of the shares soars in the future, it would be motivating for the employee to put in his/her 100%. Companies can also avoid cash outflows while exercising this option. These are a better alternative to cash incentives. In some cases, the profit earned is huge. Like in the case of Google. The employees started earning in millions after selling the shares. The ESOPs are taxed according to the time period for which they are owned. For instance, if they are owned for a period of fewer than 12 months then it is considered short-term capital. If they’re owned for more than 12 months, then it is considered as long-term capital. From 1st April 2018, the tax charged on short term capital gains i.e. selling of shares within a year is 15%. And the tax charged on long term capital gains would be 10% tax and 4% cess. For hiring the TPA, the company needs some cash flow. In cash this prohibits the long term investment opportunities of the firm, then this scheme might not be beneficial in the long run. The companies which require additional capital for the carrying on of business, this might not be beneficial. Since the working capital requirement might clash with the ESOP expenses, creating a crisis situation for the management. Some FAQs related to ESOP. Q- Who is a promoter? A- A promoter is a person who is in control of the overall functioning of the company. His/her name is mentioned in the offer letter of the employee. And this person is not eligible to obtain ESOP. Q- Are ESOPs available for the lifetime? A- No, they are valid until the exercise period. After which they can’t be converted to shares. Also, if specified under ‘the letter of grant’, they may expire once the employee leaves. Q- Does the person become a shareholder once ESOPs are granted? A- No. After this, the employee has to pay the exercise price and then it gets converted to shares. Q- Can a holding company issue ESOPs to the people working in the subsidiary company? A- Yes, if it is mentioned under Article of Association. Q- Are ESOPs legal? Who governs them? Q- Can a company change the rules and regulations of ESOPs after it is granted and accepted by the employee? A- Of course. These changes favor the employee.